$250 P/P includes your boat and parking fees, dinner, investigation and overnight accommodations. Ferry departure!!! 12:00 pm sharp!! We are going as a group so we will all use our rooms for personal use. The main kitchen we can all use to store our food. There is a refrigerator and all cooking tools. The are all listed below. I would bring a small cooler if you wish for snacks and beverages in your room. I will Email everyone the parking tickets to print out. I will meet you at the entrance of Ferry at 11:00 am !!! We all bring our own lunch and our own snacking food. Saturday dinner's main course I will provide and bring a dish to share if you wish. Welcome and thank you for making a reservation to stay at the Rose Island Lighthouse. I have included information regarding your stay in this email and in the attached parking pass. Please print out the number of passes you'll need. 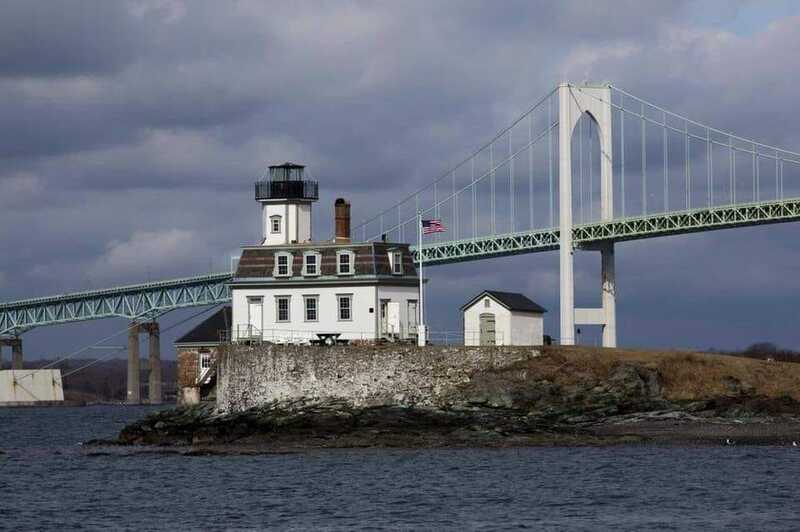 Listed in the National Register of Historic Places, the Rose Island Lighthouse museum (restored circa 1912) is open to the public from 10 AM to 4 PM each day. Also guests in the Fog Horn Building and Barracks have access to the light from 10am – sunset. From August 15 – March 1, with permission, you are allowed to bring one dog. Stay in our second floor apartment and enjoy all the amenities of home. The apartment includes a master bedroom with queen size bed, living room with full size sofa that you can pull out to sleep two. Linens and towels are provided. It has a full kitchen with a microwave, gas stove/oven, coffee pot, toaster and refrigerator. Paper towels, toilet paper and cleaning supplies are provided as well. The apartment also has a full bathroom. The lighthouse is heated but you may enjoy using the wood burning stove instead of the boiler (please bring wood in the colder months). Views from the second floor are astounding. You will need to bring your food, beverages and personal items. Drinking water is provided. PLEASE DO NOT BRING STYROFOAM TO ROSE ISLAND. However, if you’d like to bring paper goods, please do. Museum Rooms: Restored right down to the pitcher pump at the pantry sink, the museum is fully furnished with all the pots, pans, dishes and utensils you’ll need – just as if its keepers of old still lived there. Each bedroom accommodates up to two people in one extra-long double bed. Washbowls and pitchers are provided for bathing, as well as, linens and towels (beach towels are not provided). We also provide toilet paper, paper towels and cleaning supplies. There is a shared indoor toilet in the WC/pantry off the kitchen where you pump the water by hand, but most of the year you’ll go outside to use the low-flow toilets and the solar showers that also water the gardens. Pack a cooler with your food, beverages and ice (since there is no refrigerator). Please put your cooler under the stairs or in the generator building to prevent water on the hardwood floors. We provide bottled Crystal Spring water for drinking. Cook and heat water on a single propane gas burner in the kitchen or on an outdoor propane gas grill. PLEASE DO NOT BRING STYROFOAM TO THE ISLAND. However, if you’d like to bring paper goods, please do. Fog Horn Building: This very romantic room is separate from the lighthouse. Built upon the rocks next to the lighthouse, this building houses a room with a queen sized bed and a small dining table. For your use we stocked dishes, glasses and cleaning materials. This building once housed the steam machinery that generated the power for the fog horn. Not to worry, the fog horn is gone so one can enjoy the peace and quiet. As this restored room is part of the museum, please leave the door open from 10am – 4pm for day guests to take a peek. Please note, we do not allow dogs to stay in any of our overnight rooms. Guests of this room have access to the lighthouse from 10AM -sunset. Foghorn room guests are requested to use the outside bathrooms approximately 100 feet away, as there is no bathroom located inside this room. Just like the rooms on the first floor of the lighthouse, there is no shower either. This is a seasonal room without heat. There’s no fire station on the island, so we don’t allow candles. We do provide LED lanterns. However, please feel free to bring along your favorite flashlight or lantern. There is no cooking allowed in this room so guests staying in the foghorn building use the outside propane gas grills. A five gallon dispenser of fresh water is also provided. Guests are asked to bring food out to the lighthouse in a cooler as there is no refrigeration available. PLEASE DO NOT BRING STYROFOAM TO THE ISLAND. Upon check out we ask that you clean up the space, change your sheets (clean sheets and towels are in the trunk) and bring the used sheets and trash out to the captain of the boat that will pick you up in the morning. Your Check out time is 10 AM. Barracks Room #1: This very romantic room is separate from the lighthouse. This building houses a room with a queen sized bed and a small dining table. For your use we stocked dishes, glasses and cleaning materials. Drinking water is provided. If you’d like to bring paper goods, please do. PLEASE DO NOT BRING STYROFOAM TO ROSE ISLAND. Built in 1798-1800 to accommodate 300 men, the barracks were considered the finest in America at that time, consisting of nine bomb-proof chambers with 3-4 foot thick brick walls. During World Wars I and II the chambers were renovated to store explosives for the Navy's Torpedo Factory. Not to worry, the explosives have long been removed. As this restored room is part of the museum, please leave the door open from 10am – 4pm for day guests to take a peek. Please note, we do not allow dogs to stay in any of our overnight rooms. Guests of this room have access to the lighthouse from 10AM -SUNSET. Barracks room guests are requested to use the outside bathrooms approximately 50 feet away, as there is no bathroom located inside this room. Just like the rooms on the first floor of the lighthouse, there is no shower either. This is a seasonal room without heat. There’s no fire station on the island, so we don’t allow candles. We do provide LED lanterns. However, please feel free to bring along your favorite flashlight or lantern. There is no cooking allowed in this room so guests staying in the Barracks Room #1 use the outside propane grills. A five gallon dispenser of fresh water is also provided. Guests are asked to bring food out to the lighthouse in a cooler as there is no refrigeration available. Upon check out we ask our guests to clean up the space, change your sheets (clean sheets and towels are in the bureau) and bring the used sheets and trash out to the captain of the boat that will pick you up in the morning. Your Check out time is 10 AM. The wind produces enough pollution-free electricity for our compact fluorescent bulbs. (There’s no fire station on the island, so we don’t allow candles.) We ask you to use the “one light at a time rule” during your stay. A radiant oil-fired heating system in the floor keeps the Lighthouse warm and comfortable, even on the coldest, stormiest winter days (assuming you can get there – see Cancellation Policy). There is also a fire pit near the beach for you to use. Again, you need to bring wood. DEPOSITS - Relief (Nightly) Keepers - 100% deposit to confirm reservation. CANCELLATION POLICY – If you cancel for any reason, we reserve the right to retain all monies paid up to that point. We highly recommend protecting your vacation investment by purchasing travel insurance in case of last-minute sickness or accident, etc. If the weather prevents us from getting you to the lighthouse safely on your check in day, we will reschedule your stay for a mutually agreed upon date. Your parking pass includes details regarding your 10 AM departure from the Fort Adams Alofsin Pier North floating docks. The closest street address to the Alofsin Pier North is 84 Fort Adams Drive. PLEASE NOTE, OUR BOAT IS NOT THE JAMESTOWN/NEWPORT FERRY. Your Captain will be Chris and his cell is 401-474-2604. You can also call 401-847-4242 for more information. PLEASE REPLY TO THIS EMAIL SO I KNOW YOU RECEIVED IT AND YOUR PARKING PASS. THANKS.